SRV – Scientific Remote Viewing – Courtney Brown. The term “Scientific Remote Viewing” refers to a set of procedures that are an evolving although largely standardized methodology used for remote viewing. Current research suggests that the correct use of these procedures allows virtually any normal individual to obtain information about a remote location with surprisingly high levels of accuracy. 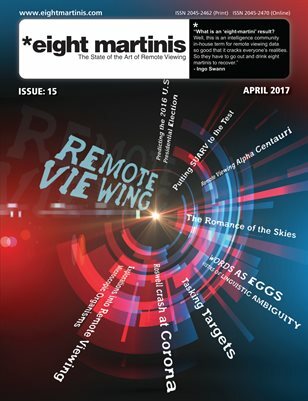 Three forms (or levels) of SRV have been developed at The Farsight Institute that are designed to assist remote viewers in describing physical targets at various geographical locations. These are Basic SRV, Enhanced SRV, and Advanced SRV. These forms of SRV should not be confused with other SRV processes that are used to describe things other than physical targets at specified locations, such as technologies, societies and groups, as well as geographical locators and numerical procedures. Advanced SRV should only be performed by a viewer who has mastered both Basic SRV and Enhanced SRV. Doing otherwise might lead to confusion and possibly poor performance. Click here for the SRV learning centre on Farsight.org, packed with videos and instructions for using this system. A YouTube collection of free audio materials available for learning SRV®. You need to be at least 18 years of age and of sound mental health to use these materials.